According to a new market report published by Transparency Market Research “Chromatography Accessories and Consumables Market - Global Industry Analysis, Size, Share, Growth, Trends and Forecast, 2015 – 2023” the global chromatography accessories and consumables market was valued at USD 7.8 billion in 2014 and is expected to grow at a CAGR of 7.5% from 2015 to 2023, to reach an estimated value of USD 15.0 billion in 2023. The report is compiled with the prime intent of updating the global stakeholders with incumbent market dynamics in chromatography accessories and consumables. For a methodical appraisal, the report analyzes the chromatography accessories and consumables market at regional level with a country wise analysis. Geographically, the chromatography accessories and consumables market has been categorized into five regions: North America, Europe, Asia Pacific, Latin America, and Middle East & Africa. On a global scale, rising demand for technologically advanced chromatography equipment as well as its potential applications for various industries is expected to be a precursor for growth in this market during the forecast period. The report further provides detailed analysis of the current and emerging trends in developed economies of North America and European countries. Moreover, North America is expected to grow rapidly due to high demand for new and innovative products along with increasing number application areas such as in medicine, forensics, chemicals, and cosmetics in the region. 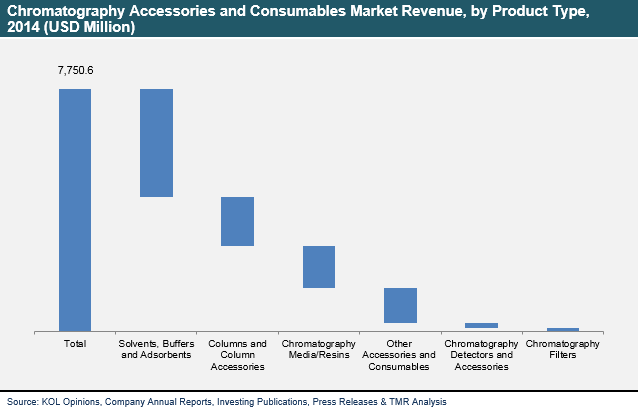 Rising awareness, government spending in R&D activities across a range of applications and well-established infrastructure are likely to boost the growth of the chromatography accessories and consumables market in the U.S. Various funding programs aimed at development of novel drugs and therapeutics is fueling the growth of the chromatography accessories and consumables market in Canada. For instance, the Institute for Research in Immunology and Cancer and the Centre for Drug Research and Development announced a collaboration in May 2015. This would boost growth in the number of drug development activities in the country, hence in turn would contribute towards the growth of the chromatography accessories and consumables market. Europe held the second leading position in the global chromatography accessories and consumables market in 2014. Factors such as high prevalence of cardiovascular, obesity-related, and chronic diseases, such as diabetes, rapidly aging population, high expenditure on R&D activities, and demand for new and innovative products are attributed to the growth of the market in Europe. Germany is the largest market for chromatography accessories and consumables in Europe. High demand and acceptance of new and innovative chromatography products, increasing number of R&D activities especially in drug discovery and development and growing government funding for R&D activities are the key factors driving the growth of the market in Germany. France is at the forefront of innovation in drug development along with presence of several large players such as Sanofi, Ipsen, Servier Laboratories, Pierre Fabre Laboratories, and Guerbet Group. According to the European Commission, the pharma industry in France invests 12% of its turnover in research and development. United Kingdom is another promising market among the EU5 countries due to high demand for chromatography based tests. Recently, the U.K. Secretary of State for Health announced a fund of USD 100 million for dementia discovery, dedicated exclusively to dementia research. Interestingly, the trend is picking up at the fastest pace in Emerging countries in Asia Pacific, Latin America, and the Middle East present a large number of opportunities in the chromatography accessories and consumables market due to a range of contributing factors. Major factors include high prevalence of various diseases, increasing number of R&D activities and respective outsourcing, shift of research and manufacturing facilities of CROs and pharmaceutical giants, and improving health care infrastructure in these regions. In Japan, augmented number of R&D activities in various chromatography application areas, presence of a strong pharmaceutical and research base, and large geriatric population along with increasing number of chronic diseases would boost the growth of the market in Japan. For instance, the RIKEN Program for Drug Discovery and Medical Technology Platforms is aimed at identification of new treatments for cancer and other chronic diseases. Therefore, the chromatography accessories and consumables market in Japan is likely to witness rapid growth in the near future. Brazil is expected to present huge growth opportunities in the global chromatography market in the near future. Improving infrastructure especially in health care, increasing R&D activities in a range of industries especially in pharmaceuticals, rising prevalence of chronic diseases, and increasing penetration of global players are the key factors fueling the growth of the market in Brazil. According to the National Treasury of Republic of South Africa, the government spent ZAR 144.6 billion (USD 12.1 billion) on health care and planned to spend approximately ZAR 157.3 billion (USD 13.15 billion), ZAR 167.5 billion (USD 14 billion), and ZAR 177.5 billion (USD 14.8 billion) in 2015, 2016 and 2017, respectively, accounting for 8.8% of the total GDP. Increased investment in health care and health care infrastructure would lead to higher demand for various chromatography accessories and consumables in South Africa market. The major players operating in the global market include Thermo Fisher Scientific, Inc., EMD (Merck) Millipore, PerkinElmer, Inc., Agilent Technologies, Inc., Sigma-Aldrich Corporation, Bio-Rad Laboratories, Inc., Phenomenex, Pall Corporation, GE Healthcare, Shimadzu Corporation, Waters Corporation, W.R. Grace & Co. Most of these players continuously innovate by developing new products and improvise existing ones to keep pace with technological advances in order to maintain their position in the global market.